Unlocking the Philippines’ full renewable energy potential can help it meet its growing energy demand, pursue low-carbon development and address climate change, according to IRENA’s new report Renewables Readiness Assessment: Philippines, which identifies key actions for the country to accelerate renewable energy deployment. In 2015, with the total installed geothermal electricity generation capacity reaching about 1,900 MW, the Philippines is second largest in the world after the US, according to the International Geothermal Association. 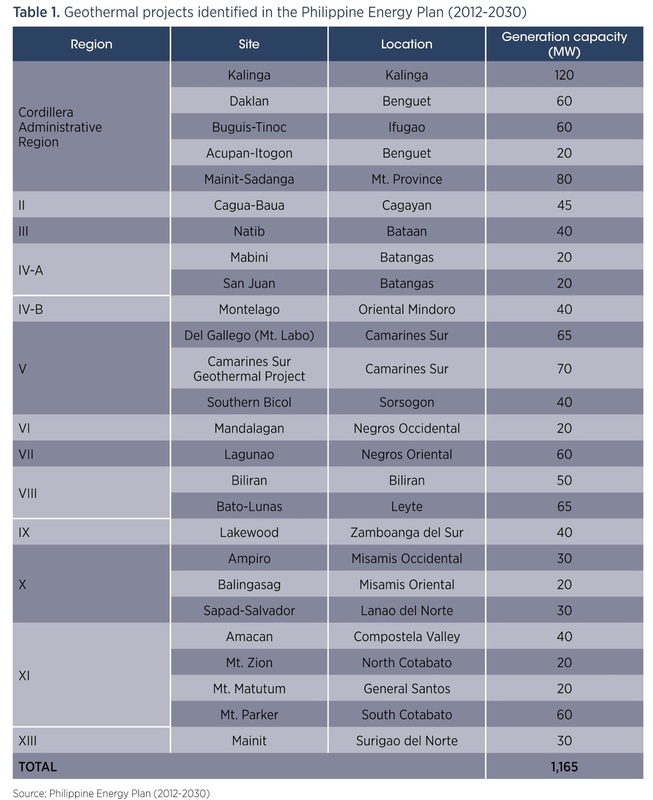 recent Philippine Energy Plan (2012-2030), the Department of Energy identified 26 sites to increase existing installed capacity by 62% throughout the 18-year planning period, as shown in the table above. 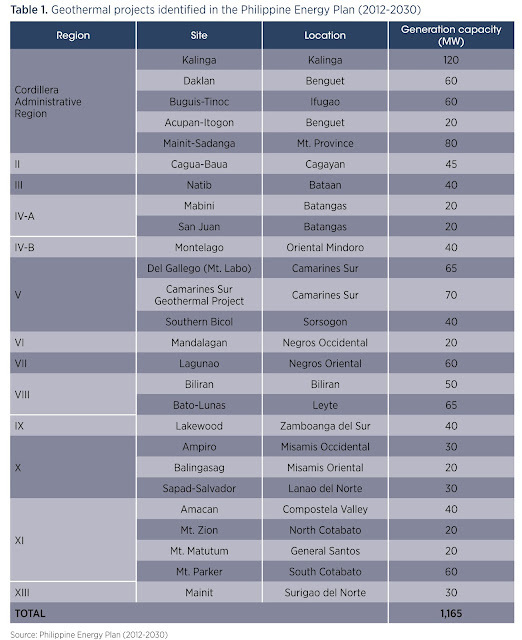 The total estimated potential capacity of these sites will reach 1,165 MW. The majority of the listed areas have either been awarded or have submitted an application for a Renewable Energy Service Contract (Bertani, 2015). Le 23 février 2017, la mairie de Paris a inauguré la toute nouvelle station géothermique du quartier Clichy-Batignolles. 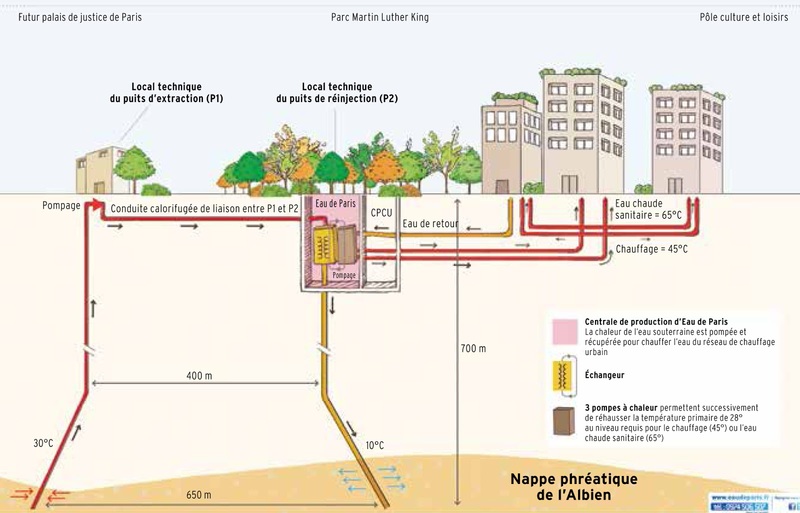 Avec cette installation énergétique, les logements de l’éco-quartier pourront être alimentés en chauffage et en eau sanitaire. Outre la dimension écologique, cette station géothermique a aussi vocation à ouvrir la voie pour un nouveau type de réseau de production énergétique localisé. Pour les entreprises en charge du développement du projet, c’est aussi l’occasion de démontrer que la géothermie possède de solides arguments pour s’imposer dans le mix énergétique de la région Île-de-France. 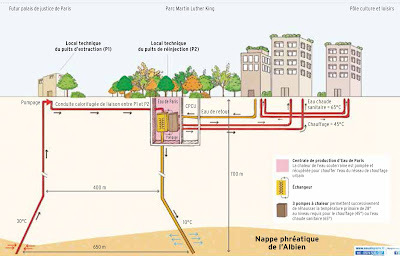 On 23 February 2017, Paris City Hall inaugurated a new geothermal plant in the Clichy-Batignolles district . With this energy installation, the homes of the eco-district will be supplied with heating and sanitary water. In addition to the ecological dimension, this geothermal station is also intended to pave the way for a new type of localized power generation network. For the companies in charge of the development of the project, it is also an opportunity to demonstrate that geothermal energy has strong arguments for imposing itself in the energy mix of the Ile-de-France region. Russia and Japan may jointly build geothermal power plants on the Kuril Islands, Japan’s largest newspaper, Yomiuri Shimbun, reported Friday. According to the paper’s sources, during the March 18 Russian-Japanese consultations in Tokyo, Russia handed over to Japan a package of 26 proposals on joint projects in the area. Japan, in its turn, prepared a similar 30-point list. The paper said that proposals to build geothermal power plants and a seafood processing plant on the islands were included in both lists. Chevron Corporation announced that its wholly-owned subsidiaries have completed the sale of Chevron’s geothermal business in Indonesia to Star Energy Consortium. Chevron received the cash proceeds upon settlement on March 31, and will reflect the gain in first quarter 2017 results. The conclusion of the sale of Chevron’s geothermal business in the Philippines is expected later in 2017. Using a proprietary app called iSteer, Brian Tapp, a geologist for EOG Resources Inc., dashed off instructions to a drilling rig 100 miles away. This tool is among the reasons the little-known Texas company says it pumps more oil from the continental U.S. than Exxon Mobil Corp.—or any other producer. A rig worker received Mr. Tapp’s iPhone alert and tweaked the trajectory of a drill bit thousands of feet underground, to land more squarely in a sweet spot of rock filled with West Texas crude. EOG uses iSteer to help navigate through rock thousands of feet underground, landing in identified layers with more precision. A device behind the drill bit underground transmits information—including depth and direction but also readings to identify types of rock and the presence of gas—to a geologist at the office. The numbers are crunched, using EOG’s databases on the location’s rock layers and on previous wells, and course corrections are sent to the driller on the rig. The apps help EOG answer a range of questions, such as how much pressure to use to crack a particular geologic stratum, to identifying ideal trajectories for drills, to more mundane queries, such as the fastest route to drive from one drilling site to the next. 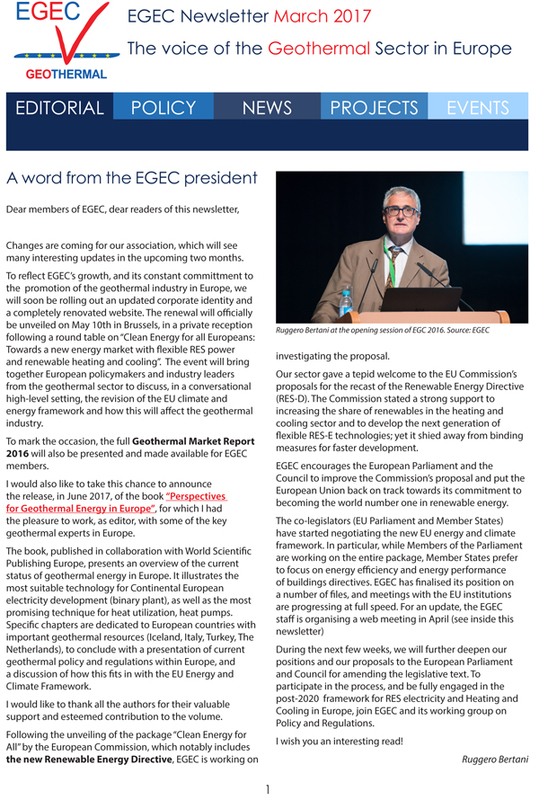 The March issue of the EGEC Newsletter is now available. Innovation in the renewable heating and cooling sector: Present your project at the RHC ETIP annual event! 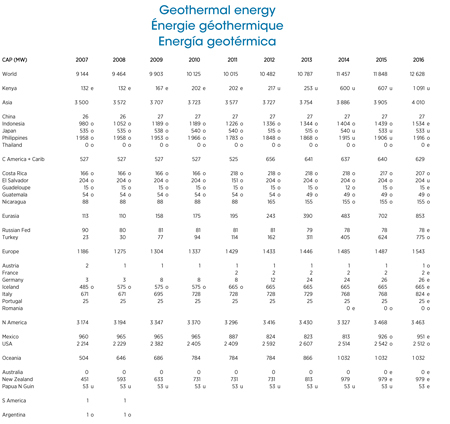 Geothermal energy: Geothermal power capacity increased by 780 MW in 2016, with expansions in Kenya (+485 MW), Turkey (+150 MW), Indonesia (+95 MW) and Italy (+55 MW). The Geothermal Association of Ireland has announced that it will host a one-day workshop in Dublin on April 6th as part of this year’s SEAI Energy Show in the RDS. 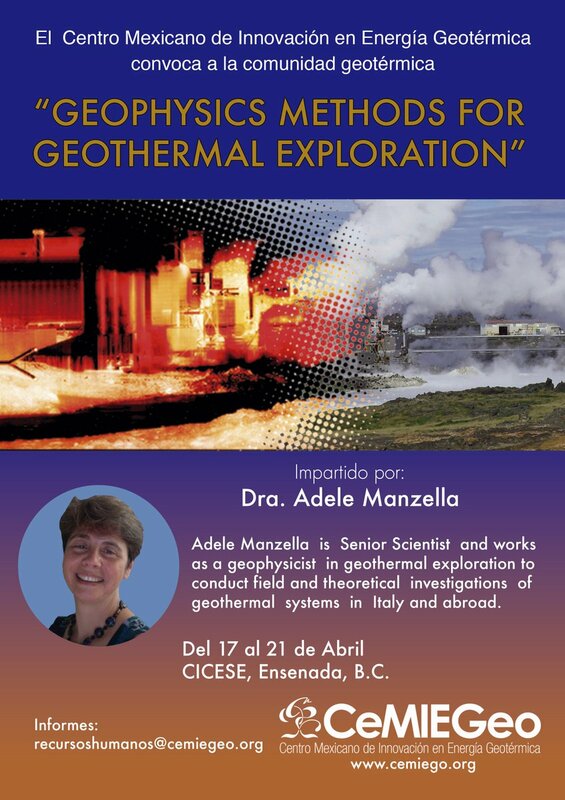 Local and international speakers from a wide range of disciplines will discuss various applications of geothermal energy. We hope the talks will be useful to energy professionals and interested members of the public. There is no cost to attend and all are welcome. Registration is from 09:30 in the Committee Room in the RDS; tea, coffee and a light lunch will be provided. 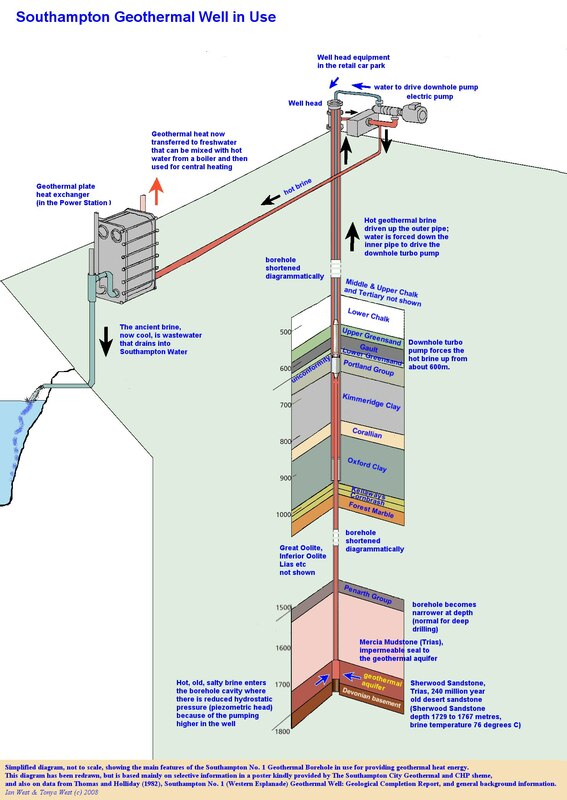 “Geothermal energy is one renewable energy source with the potential to reliably meet a portion of Canada's heating and electricity generation needs, including in northern and remote communities, where reliance on fossil fuels remains high. Today, I will be discussing the implications of this decision, as outlined by the above text, and the budget supplementary document. GreenFire Energy is looking for a Project Manager for it's forthcoming Geothermal Demonstration Project at Coso Known Geothermal Resource Area. Qualifications: Substantial experience in EPC power production, rotating equipment, and gas processing projects. Experience in oil & gas or geothermal projects preferred. The main aim of this research programme, which consists of several projects, is to develop and improve the production of geothermal power, using the heat from the earth to generate electricity. For Indonesia, a country dominated by volcanoes, it’s a renewable energy source that holds enormous potential. 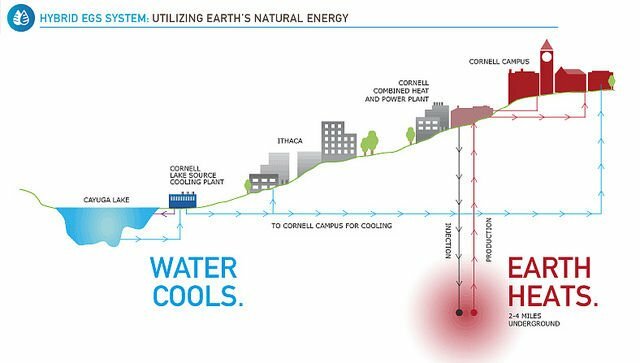 Cornell University's Senior Leaders Climate Action Group presented its findings Tuesday night regarding the school's stated goal of becoming a carbon neutral campus within 20 years and the use of an "unproven" but intriguing new method of heat production that could greatly reduce the school's carbon footprint by nearly 40 percent. The report, titled Options for Achieving a Carbon Neutral Campus by 2035, detailed the group's work to determine the viability of six different potential routes forward in the school's quest for carbon neutrality. In the end, the group chose option one, a combination of Earth Source Heat, wind, water, solar and biomass. The plan would require drilling between two and four miles into the ground in order to find a depth that would properly warm the circulating water to the point that it can be used to heat the campus' buildings. Lance Collins, the school's Dean of Engineering explained the unique challenges that the region itself presents to this sort of geothermal system-- out near the West Coast, where projects similar to this are a bit more common, the natural rate of earthquakes actually makes it easier to access the high temperatures necessary to heat the water. Lava isn't as far underground, so drilling for heat is much less rigorous. In the east, however, more drilling is necessary, though that obstacle could make the project that much more innovative. The Indonesian government has set a higher target of renewable energy usage in a bid to expand the use of clean and sustainable energy. Indonesian Energy and Mineral Resources Minister Ignasius Jonan said Wednesday that the government expected a 22-percent usage of renewable energy by 2025, higher than the initial expectation of 19.6 percent. Indonesia has a huge amount of resources for renewable energy, including hydro, geothermal, crude palm oil, wind among others. 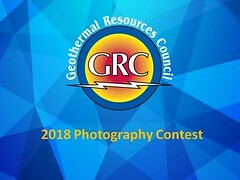 The GRC has introduced a new process for submitting technical papers to be considered for presentation at the geothermal energy event of the year, to be held October 1-4 in Salt Lake City, Utah, USA. The GRC Annual Meeting Technical Chair, Rob Podgorney, has created a video on "How To Submit Your Paper" using the CMT website. Please watch the helpful video before submitting your paper. In order to simplify the submission and review process, the GRC Annual Meeting Committee has created an new online submission and review system using Microsoft's Conference Management Toolkit (CMT). By creating a login and profile, authors will be able to submit one or more draft papers, check their paper status, and upload a final version of their papers through the CMT website. Yuran Zhang of the Stanford Geothermal program, addresses the audience at the 6th Annual Conference for the Development and Utilization of Deep Geothermal Energy, being held this week at the China University of Geosciences in Beijing. Thanks to Roland Horne for the photo. Colombian utility Chec Group EPM has announced a resumption of exploration for a geothermal energy resource in the country. There are plans to start surveying in the areas of El Páramo, Papayal and Playa Larga in the Villamaría highlands, west of the capital Bogotá. Julián López Palacio, coordinator of the geothermal project at Chec, said that the objective is to check the temperature and pressure of existing wells, to determine if the conditions are enough to generate electricity. The exploratory phase began in 1997 at the Nereidas 1 well on the Pyrenees estate. A temperature of about 200 degrees Celsius was recorded at 680 meters depth. Exploration continued to 1,400 meters but then paused. Environmetals, which is rebranding itself as Geo40, is closing in on commercial development of a patented technology to economically extract silica and other specialty minerals such as lithium and boron from the hot fluids harnessed by geothermal stations to produce electricity. Geo40 is evaluating options, including a partial sale of the business and an initial public offer, to fund the start-up of its first $NZ10-$NZ19 million commercial silica extraction plant in New Zealand next year. Managing director John Lea, a former executive with NZ dairy company Fonterra, said the group was working to finalise contract talks with two major utilities by the end of May. The venture will open up export income for Geo40 but could also be a game-changer for the fast-growing global geothermal industry where silica is a corrosive and costly headache. Proof of concept work and trials of the company’s technology has been carried out at on-site pilot plants at Contact Energy’s Wairakei power plant and Japanese utility Tohoku Electric Power’s Kakkonda plant. The extraction plants, which are erected in modular form, remove the silica from waste geothermal fluids that have been used for power generation. The fluids are pumped back into the underground reservoir through existing reinjection wells, or recycled first to generate further electricity. Southampton is now joining the club of nearly 70 British towns and cities that are committed to shift to 100 per cent clean energy by 2050. Indeed Southampton is going even further – committing to reach that goal by 2040. Southampton has been getting on with cleaning up energy supply for years – so is well placed to achieve this. We have harnessed our own local clean energy sources, to create the UK’s first geothermal power scheme. It started initially to supply only the Southampton Civic Centre, but now its users include TV studios, a hospital, a university, a shopping centre, residential buildings and a hotel – as well as public and private-sector residential developments. The district energy network has also been designed to integrate additional low or zero-carbon technologies as they evolve. We are ahead of our target to cut CO2 emissions from our own estate – and have done so every year but one since 2010. Long-term thinking and determination underpin our success. The Inter-American Investment Corporation (IIC) has signed a US$30 million corporate loan facility with Enel Green Power Chile to finance exploratory works for what could be the first geothermal power project in South America—the Cerro Pabellon geothermal power plant in Chile. The loan will be funded by the Clean Technology Fund (CTF), administered by the IIC. The project, located in the Atacama Desert at an altitude of over 4,500 meters above sea level, consists of three power plants with a combined capacity of 75 MW, an 80-kilometer transmission line and other associated facilities. The loan will finance drilling costs of the exploratory phase, when other sources of financing are typically unavailable. Schlumberger and Weatherford today announced an agreement to create OneStimSM, a joint venture to deliver completions products and services for the development of unconventional resource plays in the United States and Canada land markets. The joint venture will offer one of the broadest multistage completions portfolios in the market combined with one of the largest hydraulic fracturing fleets in the industry. Weatherford will contribute its leading multistage completions portfolio, cost-effective regional manufacturing capability, and supply chain. Schlumberger will provide the joint venture with access to its industry-leading surface and downhole technologies, efficient operational processes and advanced geo-engineered workflows. Schlumberger and Weatherford will have 70/30 ownership of the joint venture, respectively. The transaction is expected to close in the second half of 2017, and is subject to regulatory approvals and other customary closing conditions. California is privileged to have access to a variety of robust energy resources, particularly geothermal energy. It produces more geothermal power than any other state, and alone accounts for more than 20% of total geothermal energy production worldwide. Additionally, the U.S. Department of Energy’s (DOE's) National Renewable Energy Laboratory (NREL) demonstrated the importance of adding even more geothermal energy to California’s grid, which could translate to potentially hundreds of millions of dollars saved annually in operations, maintenance, and statewide utility bills. 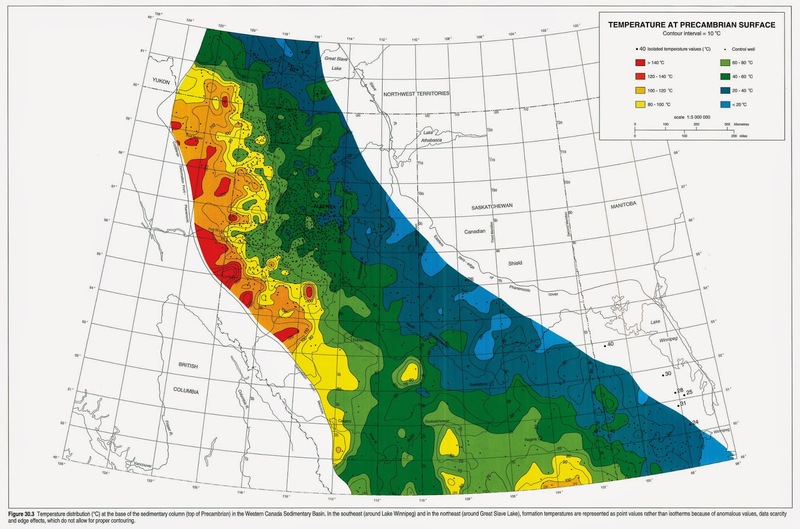 Even with this firm potential, developing new geothermal energy in a competitive California energy market remains a challenge for several reasons – some technical, others market-based. To address these concerns, DOE’s Geothermal Technologies Office (GTO) in recent months partnered with the California Energy Commission (CEC), the Department of the Interior (DOI), and several private foundations. Within a series of both formal and informal industry gatherings, including a key forum held last fall, several leading trends have emerged. A feasibility study done by Teranov, a French engineering and services company for new and renewable energy based in Guadeloupe, has proven that there is potential in St. Kitts to develop at least 18 to 36 megawatts of geothermal power. Speaking at the conclusion of a two day meeting of geothermal stakeholders, which was held at the Ministry of Finance Conference Room in St. Kitts from March 21- 22, Minister of Public Infrastructure, Honourable Ian Patches Liburd, hailed the findings as "heartening" but that the government is to consider the way forward. "We have so far done the 3G studies—the geological, geophysical and geochemical studies or the surface studies...there is potential on St. Kitts to develop at least 18 to 36 megawatts of geothermal power and that's heartening for us here in St. Kitts and Nevis," said Minister Liburd, while indicating that the next step is to consider the way forward for slim-hole and exploration drilling. On March 24, the Japan International Cooperation Agency (JICA) signed a loan agreement with the Government of the Plurinational State of Bolivia in La Paz to provide a Japanese Official Development Assistance (ODA) loan of up to 61.485 billion yen for the Laguna Colorada Geothermal Power Plant Construction Project (Second Stage). The project will meet the growing power demand, contribute to diversification of the energy matrix and mitigate the impact of climate change through the construction of a 100 MW geothermal power plant, transmission lines and incidental facilities in Sol de Mañana, which is located in the Department of Potosí in southwest Bolivia, thereby contributing to the economic development of the Plurinational State of Bolivia. The loan funds will be allocated to civil work such as well drilling, the construction of the geothermal power plant and incidental facilities and consulting services as second stage of the project following the Laguna Colorada Geothermal Power Plant Construction Project (Phase 1 of First Stage), for which a Japanese ODA loan was provided in July 2014. Interview with John W. Lund, Emeritus member of the GRC Board of Directors. One of Klamath Falls’ most unique natural resources is at the core of John Lund’s life’s work as a geothermal heat consultant. Photographs and recognition affiliated with Lund’s extensive career in geothermal energy line the wall along the stairwell in his Klamath Falls home. Lund taught civil engineering curriculum courses for more than 30 years at Oregon Tech, and has written some 250 papers on geothermal energy. He speaks fondly of lecturing on geothermal heat in 45 countries, drawing from a wealth of knowledge about the unique natural resource. 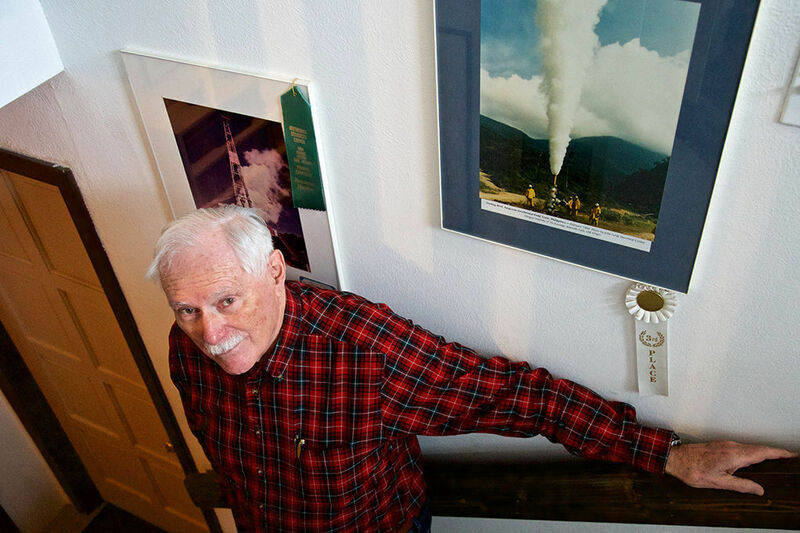 Lund spent many years working with private geothermal wells in Klamath Falls while director of the former Geo-Heat Center at Oregon Tech from 1975-2010. The government has signed Sh6.7 billion towards last mile connectivity project that will enable 1.5 million people access electricity. The loan signed with European Investment Bank (EIB) concerns a multiple scheme electrification project, targeting universal access to electricity for the Kenyan population by 2020. Thanks to today’s signature over 300,000 Kenyan households – up to 1.5 million people - will soon be connected to the electricity grid, a basic condition for further economic growth. Two further projects that we have committed to will improve access to Mombasa harbour and support geothermal energy at Olkaria” said EIB Vice President Pim van Ballekom, responsible for operations in East Africa. At Treasury, letters of intent were signed for two further very advanced projects, one being an extension of the existing Olkaria I geothermal plant. Here, the financing - for a total amount of EUR 113 million - will support the addition of a 70 MW turbine, as well as the construction of the necessary wells, steam gathering system and interconnection facilities. Advocates of geothermal energy in Alberta are celebrating this week's federal budget, which features tax incentives for development of the renewable energy, but that push might not be enough to get the industry running at full steam. "You have to have the investment environment, you have to have the consumer environment, and so I think from our perspective we're really seeing a lot of colliding forces come together," said Sean Collins, president of Terrapin Geothermics. 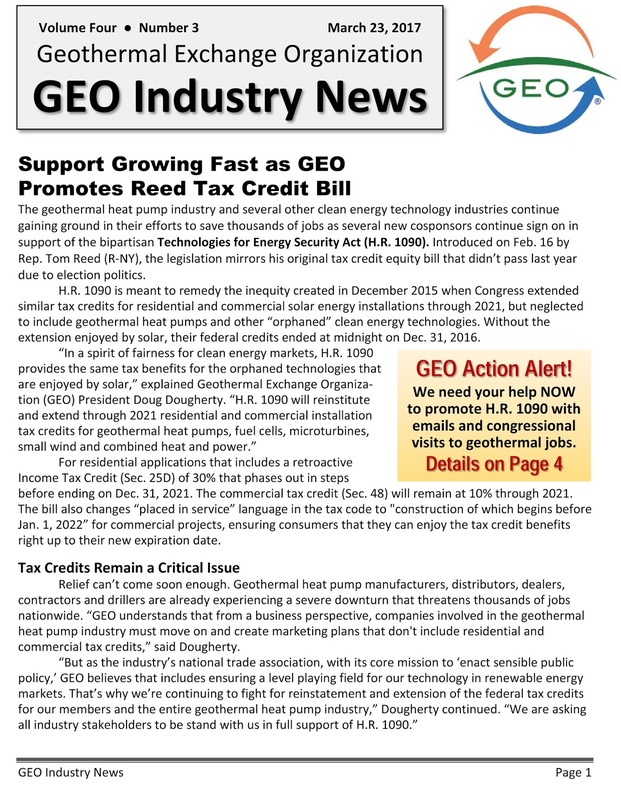 The federal budget expanded the types of geothermal projects that can take advantage of tax breaks and incentives. "We're really happy with it. I think it's one of those things, you're starting to see politicians recognize it," said Collins, who spoke to CBC News during a geothermal conference in Calgary on Thursday. Cabucgayan, Biliran – The mayor of this town foresees that the electricity rate will go down and the economic conditions of this municipality will improve after the geothermal power plant in this province will be operational later this year. Mayor Edwin Masbang, in an interview with reporters, welcomed the establishment of the geothermal power plant in the province, citing the benefits of his town being one of the host municipalities of the power plant. Masbang pointed out that his town will be entitled to royalty from the geothermal power plant and the income will be used for the development of the municipality. The geothermal exploration and power plant is owned by Biliran Geothermal Incorporated (BGI), 60 percent of which is owned by Emerging Power Inc., a Filipino corporation, while the 40 percent is owned by Orka Energy, a company from Iceland. Masbang said that BGI has already completed the drilling of eight wells with the capacity of some 100 megawatts. He said the six wells are programmed to generate power next month. Sumitomo Corporation, has been jointly engaged with PT. Supreme Energy, a private Indonesian geothermal power generation project developer, and Engie, a leading global energy company, for the development of the Muara Laboh geothermal power project located in the West Sumatra Province of Indonesia. Having met the required conditions precedent for project financing, the Project commenced construction on March 24, 2017. Under a long-term power purchase agreement for 30 years with the project company PT. Supreme Energy Muara Laboh and PT. PLN (Persero), the Indonesian state-owned electricity utility, the Project will be able to offer a generation capacity of 80 megawatts. Total costs will amount to approximately 70 billion yen, and commercial operation is scheduled to commence in October 2019. Green Energy Geothermal (GEG), the world’s first provider of turn-key flash type modular geothermal wellhead power plants, has been awarded a contract to supply and build a 5 MW turbine-generator package for the Bjarnarflag Geothermal Power Plant in the Northeast of Iceland. GEG was awarded the contract by Landsvirkjun, the National Power Company of Iceland to design, manufacture and supply a replacement back-pressure turbine and generator, which will be delivered, installed and commissioned on site. The Bjarnarflag plant is located in proximity to the Krafla geothermal field in the Northeast of Iceland, and has been an important contributor to the regional economy since 1969, satisfying not only local energy demand but also hot water for local heating supply and to the nature baths at Lake Myvatn via excess water from the plant. However, faced with an increasing deterioration of power output from the original plant’s turbine, Landsvirkjun issued a tender for the renewal of the plant in 2016, with GEG’s solution coming out on top. World Wide Fund for Nature (WWF) Indonesia, along with Indonesia's largest liquefied natural gas producer PT Arun NGL, will develop geothermal energy in Flores island, East Nusa Tenggara (NTT) province. "Currently, geothermal development is being carried out in Ulumbu and Mataloko in the western part of Flores," said Head of Provincial Mining and Energy Office, Boni Marisin. The central government has appointed PT PLN (the National Electricity Company) to develop geothermal in Ulumbu and Mataloko with a capacity of 50 MW and 22.5 MW each, respectively, Boni explained. "Geothermal development in those two areas are expected to be connected to East Nusa Tenggaras system by 2020," he stated, adding that in addition to Flores, geothermal is also found in Atadei, Lembata district and Alor district. The geothermal potential in Atadei has estimated reserves of 40 MW on an area of more than 31,000 hectares, he revealed. The striking north face of the Bernese Alps is the result of a steep rise of rocks from the depths following a collision of two tectonic plates. This steep rise gives new insight into the final stage of mountain building and provides important knowledge with regard to active natural hazards and geothermal energy. The results from researchers at the University of Bern and ETH Zürich are being published in Scientific Reports. The leakage of warm hydrothermal water, which it is important to explore for geothermal energy and the 2050 energy policy, can be traced directly back to the brittle fracturing of the upper earth's crust and the seeping in of cold surface waters. 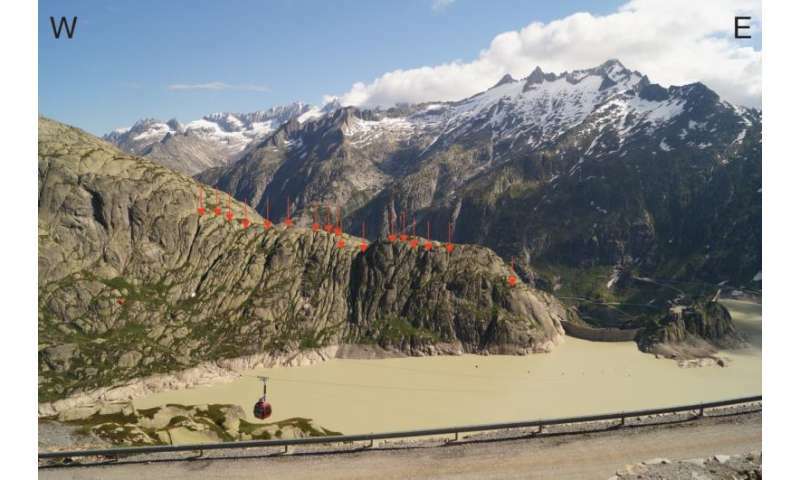 The water is heated up in the depths and arrives at the surface again through the steep fault zones – for example, in the Grimsel region. In this sense, the new findings lead to a deeper understanding of surface processes, which influence our infrastructures, for example the transit axes (rail, roads) through the Alps. Holzkirchen, one of the most southern geothermal projects in the Bavarian Molasse Basin is successful. During the production test of the last days with a continuous pumping rate of 50 liter per second a temperature of 150°C was reached. These first results reflect the highest temperature of a successful low enthalpy geothermal project in southern Germany. The well was finished about two weeks ago in a depth of about 5,000 meters and with a length of about 6,100 meters. The local utility wants to produce electricity and heat for the community of Holzkirchen. Further projects in the south of Bavaria, more or less in the same latitude as Holzkirchen are on their way. In Weilheim, a project in cooperation with Enel, the first well is in the drilling phase. The Geretsried project, with the hottest temperature of 160°C so far, starts drilling the side track in the next weeks, as in the first attempt no water was found. London, U.K. based Economic Consulting Associates (ECA) has been contracted by Norton Rose Fulbright to work with the Tanzania Geothermal Development Company to develop a strategy, legal, institutional and regulatory framework for Tanzania’s geothermal energy sector, and a partial risk guarantee for development of geothermal energy resources. ECA’s role focuses on the integration of geothermal energy into the national energy mix and the institutional and regulatory requirements behind this. 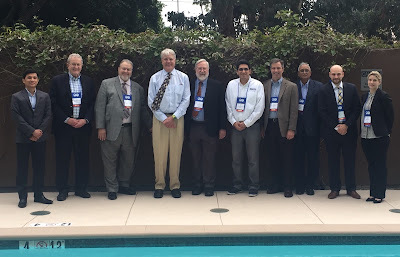 USA, California: Workshop on Exploring Geothermal and Oil and Gas Synergies is a Success! This joint Society of Petroleum Engineers (SPE) - Geothermal Resources Council (GRC) workshop brought together researchers, engineers, and field technicians concerned with Upstream E&P, Corrosion and Scaling, and Geothermal Energy. Exploring themes common to these related fields through case studies and applications, this event improved the ability to develop downhole resources safely and efficiently. exploration by B.C. Energy and Mines. The 2017 budget builds on commitments made in 2016 to invest in Canadian technology, including clean-tech – a sector that is particularly strong in B.C. The 2016 budget earmarked $1 billion over four years for clean technology. It also provides $14.5 million over four years to establish a Clean Growth Hub. One undeveloped resource in B.C. that may benefit from the 2017 federal budget is geothermal energy. B.C. has an abundance of potential geothermal energy due to its position on the Pacific Ring of Fire, but has remained undeveloped, thanks to the high costs of finding productive geothermal energy sources. 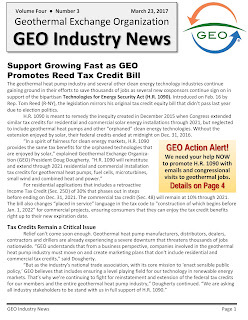 The 2017 budget includes new policies aimed at helping develop geothermal energy. They include extending accelerated capital cost allowances to a range of geothermal projects and expenses, as well as expanding the range of expenses that are eligible as Canadian renewable and conservation expenses. 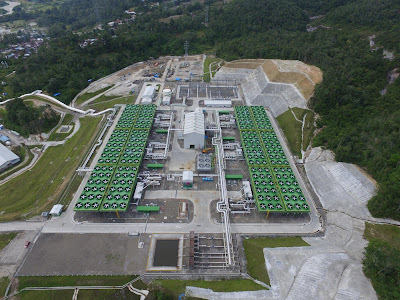 Global Geothermal News yesterday reported that Toshiba Corporation and Ormat Technologies Inc. had announced that the first unit of the Sarulla geothermal power plant, located in Indonesia's North Sumatra, had commenced commercial operation. Consortium partner Kyushu Electric Power has provided a good photo showing an aerial view of the complex. The Geothermal power utility Orka Náttúrunnar, which operates among other things the Hellisheiði power plant has found a way to make it's power even greener. By reclaiming original vegetation around their power plant the plant ensures that the environmental impact is minimal. The first step for the utility is to remove all vegetation at construction sites. The moss mat or the topsoil, with the plants and their root systems, are removed and stored to be re-introduced to the site. The utility operates industrial freezers to store moss for longer periods, up to two years. Lava boulders are also stored so that the landscape can be reconstructed. Up to £100,000 will be allocated for each scheme that shows the potential to increase energy efficiency, reduce carbon emissions and boost local economies. The funding, made available through the Low-Carbon Infrastructure Transition Programme (LCITP), will target rural and remote areas in order to help bridge gaps in capacity, skills and resources. A recent $150 million refurbishment of two decades-old geothermal power plants on the Philippine island of Luzon may sound like just another project aimed at overcoming the country's severe electricity shortages. But, for Asia's insurance companies, there is more to it. Bonds issued to pay for the upgrades and future operation costs, worth 10.7 billion pesos ($213 million), were backed by the Asian Development Bank -- the first such project bonds issued in Southeast Asia, excluding Malaysia, since the 1997 Asian financial crisis. The bonds for the Tiwi-MakBan geothermal power stations were initially purchased by the Bank of the Philippine Islands. The bank is in discussions to sell off some of the debt to insurance companies, mainly local units of multinational insurers with experience of investing in project bonds in Western markets. Investors see infrastructure projects as risky, especially green-field assets that take a long time to bear fruit. But credit enhancement -- backing by a multilateral lender, for example -- helps reduce the risk of default, encouraging institutional investors such as insurance companies and pension funds to put money into them. Eligible geothermal energy equipment under Classes 43.1 and 43.2 will be expanded to include geothermal equipment that is used primarily for the purpose of generating heat or a combination of heat and electricity. Eligible costs will include the cost of completing a geothermal well and, for systems that produce electricity, the cost of related electricity transmission equipment. Equipment used for the purpose of heating a swimming pool will not be eligible. Geothermal heating will be made an eligible thermal energy source for use in a district energy system. Expenses incurred for the purpose of determining the extent and quality of a geothermal resource and the cost of all geothermal drilling, for both electricity and heating projects, will qualify as a Canadian renewable and conservation expense. 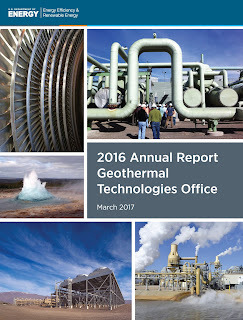 The Geothermal Technologies Office (GTO) announces the release of its 2016 Annual Report. The Annual Report recognizes advances in transformative, high-risk/high-reward science and engineering from GTO’s portfolio. 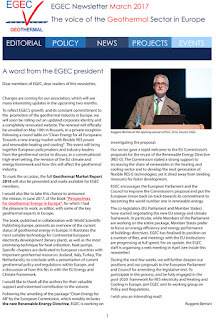 The 2016 issue highlights project successes and continued efforts in all of our program areas – Enhanced Geothermal Systems (EGS), Hydrothermal, Low Temperature and Co-produced Resources, and Systems Analysis – which are flanked by useful tools, resources, and links to more information. Highlights include FORGE and EGS advancements, projects reducing geothermal costs and risks, and advancements in technology research and development. To view the GTO 2016 Annual Report click here. Geothermal Development Company's profit after tax for 12 months through June 2016 fell to Sh 287 million from Sh 1.6 billion the year before on increased operating expenses, the state-owned company said yesterday. Revenue for the period, however, rose 24.9 per cent to Sh3.16 billion from Sh 2.53 billion on increased sale of geothermal steam. GDC's future plans include boosting steam sales through the development of 1000 MW of geothermal power from three geothermal projects. It has contracted three independent power producers through a competitive international open tender. Chief executive Johnson Ole Nchoe said each of the three contracted firms will build and operate a 35 MW geothermal power plant for 25 years.